Traditional fully homomorphic encryption (FHE) schemes only allow computation on data encrypted under a single key. 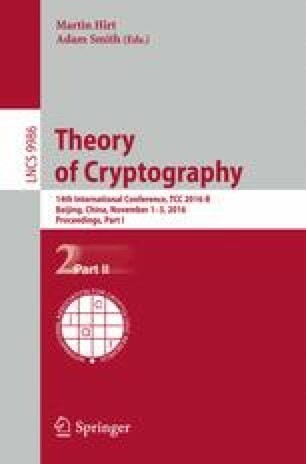 López-Alt, Tromer, and Vaikuntanathan (STOC 2012) proposed the notion of multi-key FHE, which allows homomorphic computation on ciphertexts encrypted under different keys, and also gave a construction based on a (somewhat nonstandard) assumption related to NTRU. More recently, Clear and McGoldrick (CRYPTO 2015), followed by Mukherjee and Wichs (EUROCRYPT 2016), proposed a multi-key FHE that builds upon the LWE-based FHE of Gentry, Sahai, and Waters (CRYPTO 2013). However, unlike the original construction of López-Alt et al., these later LWE-based schemes have the somewhat undesirable property of being “single-hop for keys:” all relevant keys must be known at the start of the homomorphic computation, and the output cannot be usefully combined with ciphertexts encrypted under other keys (unless an expensive “bootstrapping” step is performed). In this work we construct two multi-key FHE schemes, based on LWE assumptions, which are multi-hop for keys: the output of a homomorphic computation on ciphertexts encrypted under a set of keys can be used in further homomorphic computation involving additional keys, and so on. Moreover, incorporating ciphertexts associated with new keys is a relatively efficient “native” operation akin to homomorphic multiplication, and does not require bootstrapping (in contrast with all other LWE-based solutions). Our systems also have smaller ciphertexts than the previous LWE-based ones; in fact, ciphertexts in our second construction are simply GSW ciphertexts with no auxiliary data. C. Peikert—This material is based upon work supported by the National Science Foundation under CAREER Award CCF-1054495 and CNS-1606362, and by the Alfred P. Sloan Foundation. The views expressed are those of the authors and do not necessarily reflect the official policy or position of the National Science Foundation or the Sloan Foundation.